DVDFab Media Player is a Windows based full function media player which can be called the ultimate and best media player so far. 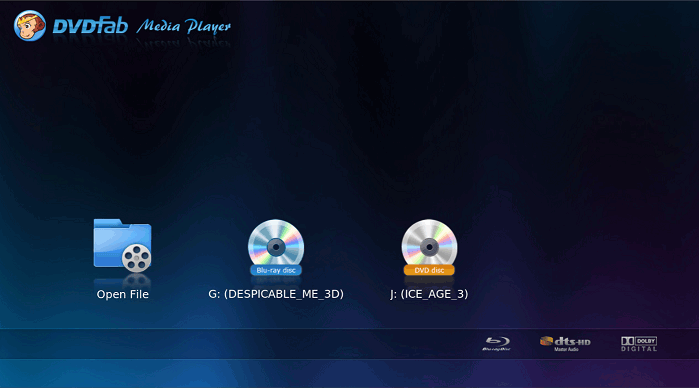 This media player can play every thing to meet your various needs: DVD and Blu-ray discs (2D&3D), DVD and Blu-ray folders, iso files, and videos in any formats. Powerful, right? And I bet its good looking and intuitive interface, easy operation, convenient settings would give you happy surprise along with other neat features. Want to get a detailed look at this super media player? Now I’ll show you from the start to the end during the operation. 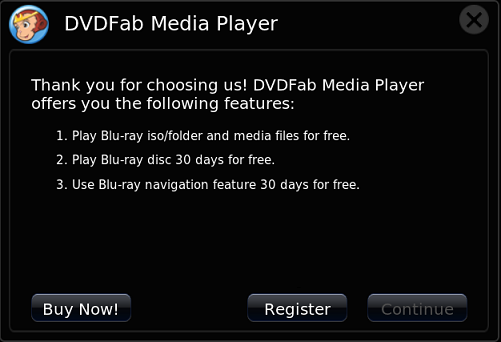 After installing DVDFab Media Player, just start it up and you’ll see a welcome screen as below, which tells you about the main features: a. play Blu-ray iso/folder and media files for free (DVD included); b. play Blu-ray disc 30 days for free (DVD included); c. use Blu-ray navigation feature 30 days for free. Then register to use, or directly click “Continue” to go on, since it’s available for 30-day trial use with full functionalities. And you’ll see the “Open File” icon in the main interface, which is used for you to click to access DVD/Blu-ray iso files, DVD/Blu-ray backup folder files, and other video files in different formats on your hard drive. If you want to play DVD/Blu-ray discs, just insert them to suitable drive, and the corresponding icons will show in the interface. If you import a Blu-ray disc/folder/iso, you will be provided with 2 options about how to play: “Quick & Simple Mode”, and “Full Navigation Mode”. The former option shows you the auto-collected movie information, including director, category, year, actors and a simple plot. You can click “Play” button to directly play the main movie title, or you can choose to view other titles presented at the bottom of the interface. The full navigation mode will give you a full navigation feature just like viewing a BD with a standalone Blu-ray Player. When a media is being played, you can also do some convenient and smart settings. For example, hover the mouse at bottom of the UI, a simple control panel pops up, where you can stop, pause, play, fast forward, fast backward, volume up, and volume down. While hovering mouse at the top of the UI, a semi-transparent control panel pops up which allows you to view in full screen, to choose subtitles, skip to any movie chapter, choose audio type, and much more. More settings can be achieved by right-clicking the mouse, and you can open other files and discs, control play, set audio and subtitles, and more.